There is nothing that remotely resembles a POST workout routine in my life. Not my current one, anyway. In a past life, after working out at my gym on the elliptical, with the weights and the stationery bike, or in the swimming pool, I’d strip off, drape on a towel and head to the steam room for 10 to 15 minutes. If I was well and truly organized, I’d massage some conditioner into my hair prior to the event—and make like I was at the spa, sans the piped in music. Yep, I do miss those days of yore. 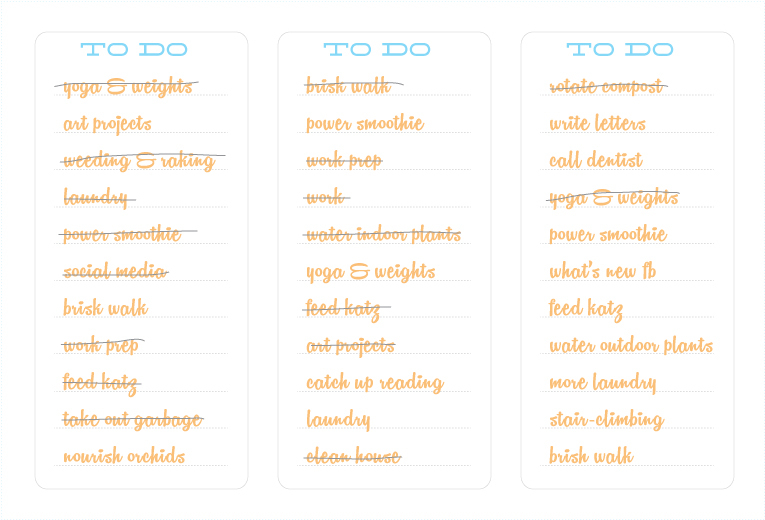 Well, looking at my usual ‘to do’ lists, I can honestly tell you that my exercise routines—whether they be the Yoga et al, gardening—which consists of rakings, diggings, and weedings—or the brisk walks, they’re usually followed by laundry, housework or Art projects. Sometimes after the Yoga and the Weights, I’ll drink the second half of my power smoothie, while sitting at the computer to get caught up on social media. And THAT is not much of a routine. My daily scheduled events melt into the next ones, with nary a thought for the period of ‘post’ workout routines. Sometimes my work days, outside of my home, require loads of walking, going up and down stairs, round and around. During those times, I’m mindful and somewhat ecstatic about being able to move at a brisk pace without pain. I challenge myself each time I go down some stairs to stop holding onto bannisters, and extend my ability to balance. Small steps, sweet victories, but alas—no routines after the fact. After reading Mizzfit’s post about recording the times, duration and specifics of the workout, I can see the benefits of taking exercises OFF the to do list and into the realm of activities that actually need to take on new meaning and a bigger dimension in my life. Then, after reading La Fitterina’s post, I’m more motivated to be aware of my body’s response to exercise, and to get more in tune with the whole psyche of exercising. Movement means More Movement! But I need to refrain from just adding it to my ‘to do’ list.